In the 1840's the farm's protector became the bearer of Christmas presents in Denmark, and was then called "julenisse". In 1881, the Swedish magazine "Ny Illustrerad Tidning" published Viktor Rydberg's poem Tomten , where the he alone is awake in the cold Christmas night, pondering the mysteries of life and death. 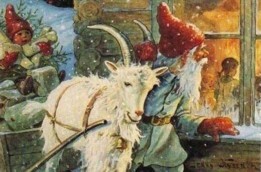 This poem featured the first painting by Jenny Nyström (see below on this page) of this traditional Swedish mythical character which she turned into the white-bearded, red-capped friendly figure associated with Christmas ever since. Shortly afterwards, and obviously influenced by the emerging Father Christmas traditions as well as the new Danish tradition, a variant of the traditions started bringing the Christmas presents in those countries. Gradually, commercialism has made him look more and more like the American Santa Claus, but the Swedish "jultomte", the Norwegian "julenisse", the Danish "julemand" (as he is more often called today) and the Finnish "joulupukki" (in Finland he is still called the "Yule Goat", although his animal features have disappeared) still has features and traditions that are rooted in the local culture: he doesn't live on the North Pole, but perhaps in a forest nearby, or in Denmark he lives on Greenland, and in Finland he lives in Lapland. He doesn’t come down the chimney at night, but through the front door, delivering the presents directly to the children, just like the Yule Goat did; he is not overweight; and even if he nowadays sometimes rides in a sleigh drawn by reindeer, instead of just walking around with his sack, his reindeer don’t fly - and many in the farming countryside of Norway and Sweden still put out a bowl of porridge for him on Christmas Eve. The use of the word in Swedish is now somewhat ambiguous, but often when one speaks of him one is referring to the more modern version, while if one speaks of "tomtarna" (plural) one could also likely be referring to the more traditional tomtar. The traditional word lives on in an idiom, referring to the human caretaker of a property (hustomten), as well as referring to someone in one's building who mysteriously does someone a favour, such as hanging up ones laundry. A person might also wish for a such a little character to tidy up for them. 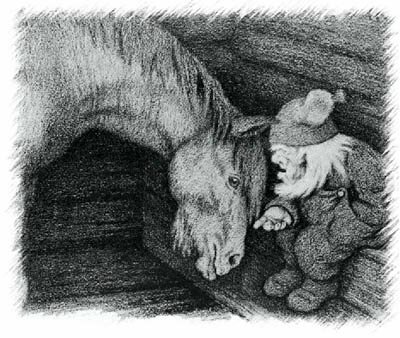 Tomten in Art/Fiction The tomte is one of the most familiar creatures of Scandinavian folklore, and he has appeared in many works of Scandinavian literature. With the collection of folklore during the 19th century, this mystical being would gain popularity. In the English editions of the fairy tales of H. C. Andersen the word nisse has been inaccurately translated as "goblin" (a more accurate translation is elf). He is still often pictured on Christmas cards and house and garden decorations as the little man of Jenny Nyström's imagination, often with a horse or cat, or riding on a goat or in a sled pulled by a goat, and for many people the idea of the farm elf still lives on, if only in the imagination and literature.